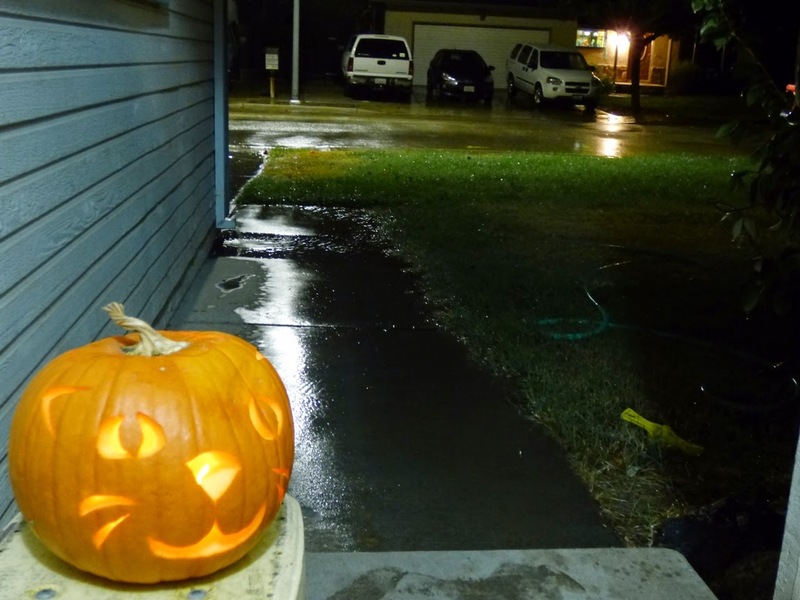 It's Halloween night, and a lot of children are no doubt disappointed that it is raining outside. We've had four kids in one group so far. Waiting for trick-or-treaters this evening has been a little like waiting for rainstorms in California over the last three years. I love numbers and statistics. I've lived in the same location for the last 23 years and the first year I was there I got a nice rain gauge for Christmas. I've been using it to keep track of precipitation in my Great Valley town about 13 miles east of Modesto. We are roughly at the middle of the valley (the center of the Central Valley! ), about 200 miles north of Bakersfield, and about the same distance south of Redding. The valley climate ranges from Mediterranean in the north to desert in the south (Redding averages about 34 inches of rain per year while Bakersfield averages just over 6 inches). Modesto's 108 year average is 12.15 inches. The highest recorded rainfall was 26.01 inches in 1983 with the lowest at 4.3 inches in 1913. I now have nearly a quarter of a century of rainfall records from my backyard, so I thought I would make some comparisons with our nearby city. The average yearly rainfall in nearby Modesto since 1991 has been 13.04 inches per year, an inch higher than the long-term average. In my little town the average from 1991 to 2011 was 14.55 inches, with a high of 26.42 inches in 1998. 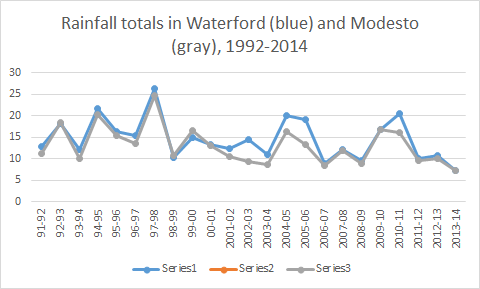 Waterford has had higher rainfall than Modesto in 20 of the 23 years that I've measured. I am guessing this is because we are slightly higher in elevation (by a grand total of 70 feet or so), closer to the Sierra Nevada foothills, and farther from the rain shadow of the Coast Ranges. The most rainfall I recorded in a single day was 2.32 inches on January 2, 2006, and the wettest single month was February of 1998 with 8.64 inches. Some of you in wetter climates may find these numbers amusing (I note a day in 2010 when Big Sur got 22 inches of rain...in 24 hours!). But as I've said, we live in an arid climate. Irrigation is all that keeps most parts of it green. The scary part of the story is that of the last decade. There were a few wet years, but six of the last eight years have been well below average, only about 75% of what was once normal. Last year was the driest I've recorded. Our reservoirs are functionally empty and there has been little or no snowpack. We actually drove over Tioga Pass in January of 2012, and it was t-shirt weather. Tioga is usually closed from November to May because of snow, but not these days. Here's hoping that tonight's storm, as disappointing as it is for the Halloween trick-or-treaters, is a harbinger of wetter times to come. It's a frightening situation all around.